Day 11 of the ARD Competition featured only the Harp Finals, with Emmanuel Ceysson (France) the overwhelming favorite to win—and Ruriko Yamamiya (Japan) and Anneleen Lenaerts (Belgium) to hope for an upset. All three played the concerto by Rinehold Glière op.74, which is a beautiful work that my colleague found steals from Brahms’ Fourth Symphony and I think leans heavily on the promenade theme from Musorgsky’s “Pictures at an Exhibition”. No matter how nice it is, three times is too much, even if the BRSO (under Lawrence Renes) does the accompanying. The first movement, Allegro moderato, didn’t sound good with any of the three harpists. Every time the sound of the soloists during the tutti passages was hard, didn’t resonate, and even Ceysson, incredibly nervous, could make project the notes with his usual radiance. 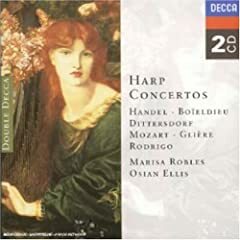 Ceysson (25 – and a dead ringer for Mango if you remember the SNL skit) has been a jury member of harp competitions in his own right, is a guest professor at London’s Royal Academy of Music, and first solo harp of the Paris Opera. Unlike the Bloomington competition, where he won coming more or less out of nowhere, at the ARD competition, the pressure was so intense because anything but a win would have been quite an embarrassment for the young man whose technique is probably envied by all jury members. But he also knows how exactly to play to impress the judges and with sheer ability to spare, his slow movement (less lyrical but full of careful dynamic gradations) and especially the last movement were full of moments where he got to strut his stuff. Marisa Robles, Osian Ellis et al.